Now that you have set up the campaign and you have created at least one ad inside an ad group, you will see the campaign as enabled, which means that your campaign is active. Use the list on the left to quickly access your campaigns and different ad groups inside each of the campaign. When you click on one of the campaigns, at the top you will see the type and the sub-type of the campaign, budget and targeting options. The tabs provide details about each of the segment of your campaign which help you monitor and optimize campaign. Use different tabs to access different settings, such as ads, keywords, audience, ad extensions, etc. There are features created to help you monitor the performance of ad group, individual ads and keywords. You will see the number of clicks, impressions, CTR, average CPC, costs and average position. This way, you will also see the total for two networks, in case you have chosen to use both search and display network, which helps you determine the success of your ads in each of them. You will also be able to compare different metrics for ads groups, ad or keywords. This is how you determine the keywords and ads with low performance, which might be harming the performance of your campaign and reducing your quality score. You can also customize the columns in the report, so that you see only the data your find relevant for measuring the performance, and whether your goals have been achieved. Additionally, you can use “Automate” button to choose different automation options and create rules inside your Google AdWords campaign. 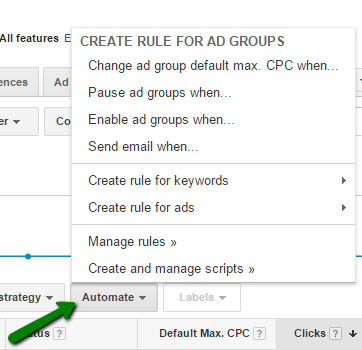 For example, inside the “Ad Group” tab, you will see the option to automate campaign for that specific group, by choosing rules such as “Pause ad groups when…”, “Enable ad groups when…” etc. 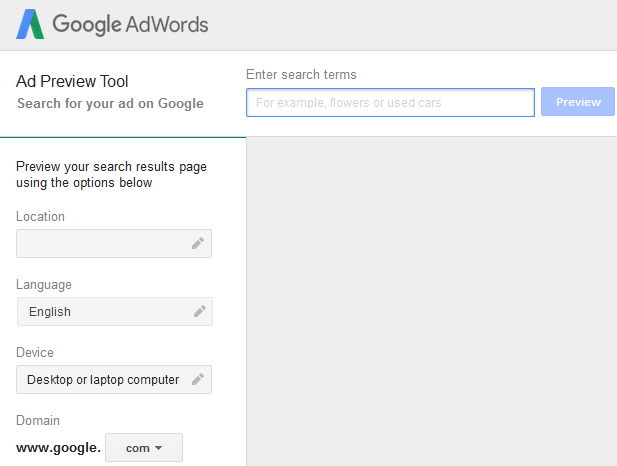 You can also create similar rules for keywords and individual ads. Using different a set of rules you are able to optimize your campaign and reduce time you would spend monitoring campaign and changing options manually. Once you click on the “Automate” button, you will be able to create rules by choosing the settings. You should preview the settings before you enable them. You are allowed to have up to 100 active rules in your account. In addition, you can also choose a period of the day or specific days when the rule is going to be active. Ad Editor is a free Google application that allows managing Google AdWords account offline. After you download this tool, you can download existing or create new campaigns, work on them offline and implement changes before you upload them to AdWords account. Have in mind that this tool only shows the results in the Google Search Network and you might not always see the ad extensions in the preview. When it comes to the time necessary to spend in optimization of the campaign, it will depend on your account settings and performance. First of all, you have to allow campaign to run for a while before you are even able to see if some aspects should be altered in order to enable better performance. You should have a campaign running for at least a week, or have a campaign that had at least 100 clicks, before you can analyze the efficiency. Since situation on the internet can change rapidly, you have to monitor the campaign regularly. You should log in at least once a day just so that you can quickly examine the data. If you see any potential problems and if you notice extremely low performance of certain ads or keywords this will mean that you have to explore the cause and try to optimize the aspect of the campaign that is causing low performance. The structure of the campaign is important as it allows you to monitor the performance of the campaign, ads groups, as well as performance of individual keywords. If you want to benefit from your campaign and if you want to see real progress, you have to focus on the segments that provide the best results. Those might be specific keywords or ads, but if the campaign is well-structured you will be able to easily detect winning keywords or ads. Campaign structure consists of keywords, which are grouped into ad groups. Ad groups are then grouped in campaigns, which are all part of your Google AdWords account. When organizing keywords, you should focus on grouping keywords that convert well. Use AdWords account to explore CTR of different keywords and group the ones that have highest CTR inside one ad group in order to get the best performance. When it comes to campaign, creating several different campaigns can really help you maximize the results and optimize your advertising activity. You should create a separate campaign for your brand, and a different campaign with generic keywords that are associated with your company. For example, if you want to advertise a company that manufactures furniture, you should create a separate campaign for your company name and brand name, and you should have a different campaign for generic keywords that are associated with your company, such as furniture, home decor, as well as other words associated with furniture, such as tables, wardrobes, beds, etc. Having in mind that the group of generic keywords is very extensive, you have to make sure that you structure them properly, using different ad groups.